In 2019, military student loan forgiveness benefits remain widely available to all branches via the Forever GI Bill (or for those older personnel, via the Post 9/11 GI Bill or Montgomery GI Bill). The best loan forgiveness benefits on offer to military personnel still come from the Military College Loan Repayment Program (CLRP), which offers up to $65,000 in school loan forgiveness benefits simply for joining the military or renewing a service contract. In fact, Military CLRP remains one of the most powerful Federal Student Loan Forgiveness Programs available to anyone in or outside the military, but the great news is that even if you don’t qualify for CLRP benefits, you are guaranteed to qualify for the single-best loan forgiveness program available to anyone, anywhere, called the Public Service Loan Forgiveness Program, or PSLF. This Guide will walk you through all of the eligibility requirements, application procedures, and approvals processes for the CLRP programs for each branch of the military, but I’ll also cover the important parts of the PSLF, and all the other Military-specific forgiveness programs as well. If you have any questions after reading through this Guide, please feel free to ask them in Comments section below. I review Comments on a daily basis, and will do my best to get you a reply within 24 hours! The rest of the Guide goes into each program in detail, explaining what it is, what it offers, and how to take advantage of the benefit. For easy navigation, please click the links above to be taken to each program’s specific section within this Guide. And remember, if you have questions about how these programs work, then ask away in the Comments section at the bottom of this page. Let me give you one really important piece of totally honest advice – EVEN IF you do end up qualifying for Military Loan Forgiveness benefits, there is a pretty good chance that everything isn’t going to work out as smoothly as you had hoped. I can say this because I regularly receive comments from visitors who are having trouble receiving payments, getting payments applied to the right accounts, or running into all manner of other issues with the benefits that they were supposed to be receiving, so I want to warn you about it in advance. 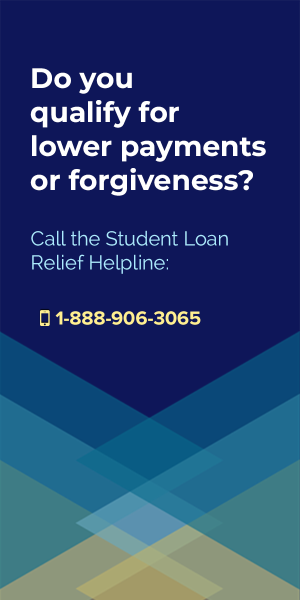 To protect yourself from getting buried by inescapable student debt if your forgiveness benefits don’t quite live up to the hype, I recommend looking at alternative solutions as well. The Military College Loan Repayment Program is only available if you’ve already accumulated student loan debt and are considering joining the military in an active duty role, or if you’ve previously served in an active duty role and are now considering joining the reserves. Remember, if you don’t qualify for CLRP, then don’t give up, because you’ll still be eligible for PSLF, which is an even better forgiveness program. To skip to the PSLF section of this Guide, click here. CLRP benefits are available from most branches of the military, including the Army, Navy, Air Force, National Guard, Coast Guard and some branches of the Reserves as well. In order to qualify for military loan repayment program benefits, you’ll have to meet the following eligibility criteria. As you can see, this program isn’t for everyone, since it requires being a new service member, or joining the reserves. If you’re already enrolled in the military, and plan on staying there, then you won’t be able to take advantage of the CLRP. However, don’t forget that you still have access to the BEST student loan forgiveness program available to anyone, the Public Service Loan Forgiveness Program. For details on how PSLF works, click here! Not all student debt qualifies for CLRP. In fact, it’s limited to only a small subset of the total possible student loan programs floating around. As you can see, this severely limits which student debt is actually eligible for CLRP benefits. I run into people all the time who ask why they haven’t been getting disbursements, and sometimes it’s as simple as the fact that they didn’t pay close enough attention to eligibility guidelines. For example, I’m constantly getting hounded by service personnel who tried to get repayment benefits for private loans, but that’s not possible via CLRP. How Much Money Does CLRP Provide? The amount of money you are entitled to varies depending on which branch of the military you join, but the maximum amount of military student loan forgiveness you can receive in your life is capped at $65,000. The amount of money you’ll receive from CLRP is also partially determined by your duty-status, with active duty members eligible to receive up to twice as much as those personnel who join the reserves. Active duty enlistees are entitled to receive up to 33.33% (or $1,500, whichever is greater) of their loans outstanding principle balance paid for each year of service that they complete. Enlistees in the reserves are entitled to receive up to 15% (or $1,500, whichever is greater) of their loans outstanding principle balance paid for each year of service that they complete. So here’s the crazy thing about CLRP benefits – you don’t get it all at once, but you can get a third of your outstanding debt paid each year. Keep in mind that it’s not 1/3 on Year 1, 1/3 of the original amount on Year 2, etc. The amount of money you get in forgiveness declines each year, because it’s 1/3 of the outstanding (or remaining) balance due. Got that? This is important to remember, and it’s another one of those little details that many service personnel don’t pay close enough attention to. Bottom line, don’t think that your loans will disappear after 3 years! How Does CLRP Work for Each Branch? CLRP benefits are available from all branches of the military, but each of them have different requirements, different lifetime maximums, and different ways of disbursing the benefit. The key thing to consider here is that you’ll get better benefits from certain branches, and literally nothing from others (looking at you Marines!). I’ve developed full pages explaining all the details of each branch’s SLRP program in detail, which you can find through the links below. After reading through these highlights, if you want more information, click through to get to the full Guides for each branch. Out of all the service branches, the Army’s CLRP benefits package is typically regarded as the best, since it provides up to $65,000 in lifetime student loan forgiveness. The benefit is doled out on an annual basis, beginning as soon as a Soldier completes his first year of qualifying service, and provided at a rate of either 33.33% of his or her loan’s outstanding principle balance, or $1,500, whichever amount is greater. For full details of how Army CLRP works, please visit my Guide to the Army Student Loan Repayment Program. Members of the Army Reserves are eligible to receive some loan forgiveness benefits as well, though it’s not quite as valuable as what the regular Army Soldiers get (which makes sense). After their first year of service, Army Reserves personnel will receive annual forgiveness of up to 15% of their outstanding principal balance, or $1,500 (again whichever amount is greater). I cover the Army Reserve CLRP benefits in detail at the same link above, so please click it for additional information. Sailors have access to about the same benefits as Soldiers, with up to $65,000 in lifetime loan forgiveness available to those who qualify for the benefit. Like Soldiers, they’re only eligible to begin receiving CLRP benefits after they’ve completed at least a year of service, and they can’t qualify for the program unless they agree to sign up for at least four years of service. For full details on how Navy SLRP works, please visit my Guide to the Navy Student Loan Repayment Program. Reserves Sailors don’t have access to quite as much benefit as their Active-Duty counterparts, with a lifetime max of only $10,000 of total loan forgiveness. They’re only able to begin receiving repayment benefits after completing their first year of service, but unlike the Active-Duty Sailors, they’ve got to sign up for a longer service contract as well, agreeing to serve for at least 6 years. I’ll go through details of how Navy SLRP works at the same link above, so click it for additional information. Airmen get short-changed in terms of what’s available to them, with only $10,000 in lifetime loan forgiveness benefits on offer, and about the same eligibility rules applied to Soldiers and Sailors. If you’re main reason for joining the military is to secure some financial assistance for your student loan debt (which honestly is not a good idea, and one that you’ll probably regret) then you’d do best to look to one of the other branches, because you’re not going to get much help here. Anyway, for the full details on how Air Force CLRP works, please look at my Guide to the Air Force Student Loan Repayment Program. Let’s not forget the Guardsmen, who’ve been especially busy in recent years with the wars in Iraq and Afghanistan, and who were finally made eligible to receive some serious financial assistance a couple years back. Both Officers and enlisted National Guard personnel are eligible to receive up to $50,000 in student loan forgiveness benefits, but the eligibility criteria for qualifying to receive these benefits is pretty complicated. If you’re interested in finding out how it works, you’ll need to visit my Guide to the National Guard Student Loan Repayment Program. Speaking of being short-changed, things are even worse for the Marines, where no student loan debt forgiveness has been made available since way back in 2011. In a certain way, it does make sense that they wouldn’t offer the benefit, since the Marines have the lowest rate of enlistment by college graduates, but still… it doesn’t seem very fair. Basically, ever since the heavy-fighting in Iraq ended, and we apparently don’t have a huge need to enlist new Marines anymore, the benefits dried up. Unless another major war starts sometime soon, I wouldn’t expect these to be offered again, since there’s no real need to inflate enlistment in the Marine Corps while we’re at peace. On the other side of coin would be the Coast Guard, who do receive a substantial percentage of enlistees from among the population of college graduates, and who offer up to $30,000 in loan forgiveness to new personnel. Like the Army, Navy and Air Force loan forgiveness programs, benefits are first made available after completion of a year of service, but unlike them, the limitations include a stipulation that only $10,000 can be received each year. For full details on how the Coast Guard’s program works, please visit my Guide to the Coast Guard Student Loan Repayment Program. Above, I mentioned that you will receive payment based on the “outstanding principle balance” of your student loans, which unfortunately means that interest is not covered by traditional military student loan forgiveness program benefits. And that means that any interest that has accumulated on your student loan debt will remain entirely your responsibility, which is a bit of a bad deal, because the thing that makes student debt so expensive is the compound interest, which racks up tons and tons of debt over long periods of time. However, do keep in mind that you can still save up to $65,000 in total benefits by getting access to military loan forgiveness benefits, so it’s not that big of a problem, and certainly not one that should lead to you giving up on pursuing these benefits. No matter how you look at them, the amount of money you could be saving via the military loan forgiveness programs is huge. A second drawback to traditional military loan forgiveness benefits is that the amount of benefit you receive each year is supposed to count toward your annual taxable income, which must be reported to the IRS, and which means that you have to pay taxes on whatever amount you receive. That could be a substantial sum, especially if you’re getting $10,000+ in benefits each year, so you’ll need to plan ahead to deal with the tax liabilities incurred as a result of your participation in the military student loan forgiveness program. Fortunately, the way that the CLRP programs have been set up is that your benefits aren’t given to you in cash, or a check, as the loan repayments are made directly from the Federal Government to your lender. That may seem like a drawback, but the good part about how this works is that the Government will hold back 28% of its payments to be provided to the IRS, covering your tax liability. Why? Because we all know how hard it is to come up with a huge lump sum of taxes at the end of the year, and since the Government holds back the 28% of their payments for you, your tax liability will already have been covered. Which means that even though you’re being taxed on the benefit, you don’t actually have to come up with any of the cash out of pocket, so you don’t have to pay anyone anything! However, the downside to this detail is that it means you won’t actually get $65,000 in forgiveness benefits, since 28% of that $65,000 ($18,200) is going to be put toward taxes, and paid to the IRS instead of your lender. That means that if you maximize your benefit and get the full $65,000 in repayment value, you’ll actually only get $46,800 of your student loans paid off ($65,000 – $18,200). Still, it’s a lot of money, and it will certainly help you reduce your out of pocket student loan costs. Remember up above where I mentioned that CLRP isn’t the only loan forgiveness program available to military personnel? The good news is that while many of you won’t qualify for CLRP benefits, there’s still plenty of other programs that you almost certainly will qualify for, including those listed below. Let’s take a closer look at the other benefits packages available to service members, including PSLF, National Defense Student Loan Discharges, and the Servicemembers Civil Relief Act. After we go through these programs, I’ll make sure you’re aware of all the potential debt relief options floating around by giving you details on a variety of other programs created to help everyone, including military and non-military borrowers. The Public Service Loan Forgiveness Program is one of several debt forgiveness programs overhauled by updates to President Obama’s Student Loan Reforms put in place nearly a decade ago. PSLF is the single best form of student loan forgiveness for people NOT in the military, but it can also be taken advantage of by military personnel as well, which is an amazing option for those of you who plan on staying in the military, or moving into some kind of Public Service position once you separate. The key factor in determining if PSLF will work for you is to think about where you’re going to be 10 years from now, because PSLF offers a complete student loan discharge in return for 10 years of full-time, public service work. To qualify for the PSLF discharge, you have to make 120 full, on-time student loan payments, which means 10 years worth of payments, while simultaneously satisfying the employment requirement of working at least 30 hours per week in a public service position. What Jobs Qualify for PSLF? Public service positions include any Government work, meaning being employed by the Federal Government (like Military Personnel are), a State Government, or a local Government position, or working at a Non-Profit(c)(3). Keep in mind that jobs with the Police, Park Rangers, Firefighters and other similar civil agencies are all technically Government positions, and that since so many ex-military personnel move into these fields, there’s a pretty good chance you may end up qualifying for PSLF even if you do leave the military. 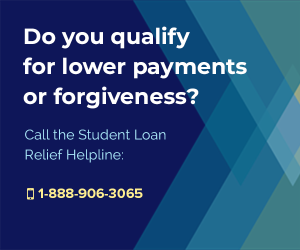 One final eligibility condition for PSLF is that your 120 payments must be made while you’re enrolled in one of the Income Based Student Loan Repayment Plans, which as of this year, means you have to be enrolled in the Pay As You Earn Repayment Plan (PAYE), the REPAYE Student Loan Repayment Plan (REPAYE), the Income-Based Repayment Plan (IBR), or the Income-Contingent Repayment Plan (ICR). 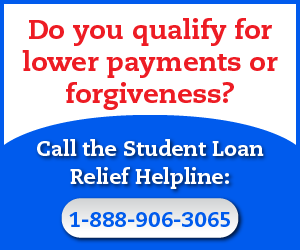 You’ll have to do some research to find out if this program will actually benefit you, because some federal student loans end up being totally repaid by the time they’ve been in active repayment for 10 years, but PSLF is literally the best forgiveness program for the vast majority of Federal student loan borrowers, and especially those who don’t make much money, and who have huge amounts of debt. If you think there’s a chance that you’ll remain in the military for 10 full years, or that you’ll move into some kind of Government or Non-Profit work, then I would highly advise you check out my Guide to the Public Service Loan Forgiveness Program. If you used a National Defense Student Loan to help pay for the costs of your college education, then you may be able to have those costs partially discharged by taking advantage of this unique program. Recipients of National Direct Student Loans and Perkins Loans are eligible to receive partial cancellation of their loans (debt forgiveness), for serving in the Armed Forces if (and only if) their military service included at least one full year in a hostile fire or imminent danger pay area. 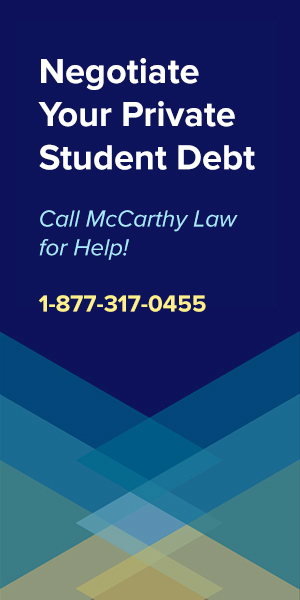 If you think you might qualify for a National Defense Student Loan Discharge, all you have to do is send a copy of your DD214 discharge form and a letter explaining why you believe you qualify for this program to the company who services your loan. While success rates for this program haven’t been widely reported, there are definitely some indications that it’s worked for certain individuals, and it is certainly worth pursuing if you meet the stated eligibility requirements. The Servicemembers Civil Relief Act (SCRA) was passed by President Bush in 2003, and is essentially an addendum to the Soldiers and Sailors Civil Relief Act (SSCRA) originally created in 1940. These two laws help clarify and define benefits provided to active duty members of the military. 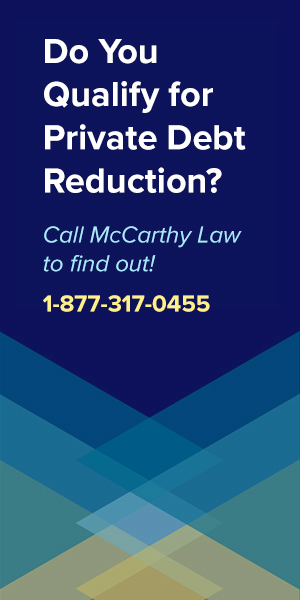 How could you use the SCRA benefit to your advantage? If you have student loan debt (or any other debt for that matter) which is being charged an interest rate higher than 6%, and this debt was created before you joined the service, then you may be entitled to have that interest rate reduced (sometimes dramatically). While this certainly works for student loan debt, it also applies to credit card debt, mortgages, car loans, or other debt that you may have accumulated prior to enlisting in the military. Unlike interest deferments, the SCRA interest rate reduction actually forgives debt, it doesn’t just delay your payments til a later date. While you can’t apply this benefit to any debt you accumulated after joining the military, it is a major bonus to those of you who have pre-service debt which is being charged anything over 6% interest. To receive this benefit, you’ll need to contact whoever is servicing your loan, in writing, provide them with a copy of your orders, and an official request to have your interest rate reduced according to SCRA law. You’ll only receive a reduced interest rate for as long as you continue to serve in the military, so don’t delay this request another day. You could stand to save tens of thousands of dollars by acting quickly. If you’re still having trouble with Federal student loans even after you’ve taken advantage of the military programs outlined above, then the good news is that there are all sorts of additional financial aid packages available to you. These programs weren’t created specifically for military personnel, but they’re available to anyone holding Federal student loan debt, so if your loans were provided by the Federal Government, then you’ll certainly want to see if any of this can help. 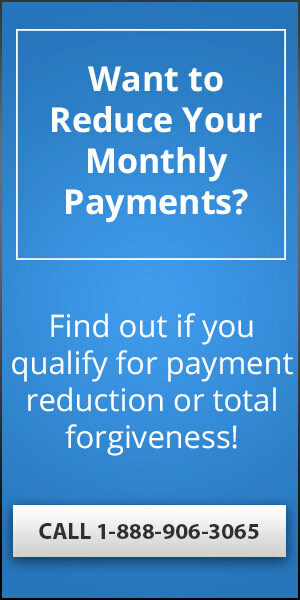 Remember, your access to the Military College Loan Repayment Program and the Public Service Loan Forgiveness Program should definitely be taken advantage of, but if you don’t qualify for them, or if those programs fail to wipe out the entirety of your Federal debt, then you’ll want to look into some additional Forgiveness options available. It’s almost a certainty that at least one of the Guides above will be able to help you access some kind of Federal forgiveness benefit! What if My Loans Aren’t in Good Standing? One thing to keep in mind is that most of the Federal assistance programs outlined above are only available to people with loans in good standing, meaning that you’ve remained in repayment status by making your monthly payments. Hopefully these will help you get back on track, either into Repayment status, or at least ending the wage garnishment that steals funds directly from your paycheck! If you don’t think it’ll be possible to get your loans back into good standing, then I would highly recommend you review your options for attempting a Federal bankruptcy discharge, which I’ll outline below. If you feel like you’ve got zero chance of ever getting rid of your loans, then the good news is that there’s still a chance to wipe out your debt via filing for bankruptcy, and qualifying for a Federal Student Loan Bankruptcy Discharge. This isn’t an easy thing to do, but it certainly is possible, and it’s worth looking into if you have a huge amount of debt, and you make very little money. Check out my Guide to Federal Student Loan Bankruptcy Discharges for details on how the program works. 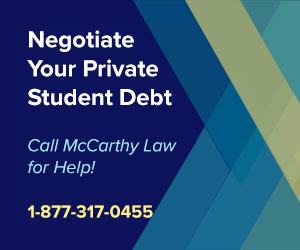 Finally, if your students loans aren’t Federal, then nothing I’ve outlined on the page above will help you in any way, but fortunately, there are some options providing financial relief to private student loan borrowers as well, so let’s look at them below. The hardest form of student debt to get rid of is certainly private debt, because there are far fewer avenues available to eliminate it. Why? Because it isn’t subsidized by the Federal Government, and because Federal regulators have mostly left the industry alone, choosing to let lenders and servicing companies basically run wild with the way that they handle collecting on their outstanding loans. Hopefully, by this point, you’ve found some program that offers financial relief, because if you’ve looked through all the Guides I linked to above, and still aren’t able to get some form of assistance, then I would argue that you’re basically out of luck. Are These Benefits Enough for Military Personnel? Do you think that the benefits programs for military personnel offer enough to help prevent our country’s service members from being crushed by student loan debt, or are they just the first small step in the right direction? Have you used any of these programs, and do you have input that you can share with others? If so, please share your experience in the comments section below! The more people we get working together to talk about the problem of military student loan debt, the more likely Congress is to act by creating new programs and benefits packages that can truly help. To find out more about how military benefits can save you tens of thousands of dollars in education-related expenses, please visit my Guide to Military Education Benefits. In it, you’ll find out how to use programs like the Post 9/11 GI Bill, the Yellow Ribbon Program and Military Tuition Assistance which can all help fund your future educational expenses. And finally, don’t be shy to check out the many other links available on my site, because as I’ve already outlined, there’s tons of information here to help people in the same situation as you. The only way that the Military Student Loan Forgiveness Programs will continue to be offered is if more people find out that they exist, and sign up for them! Do your part to ensure that we don’t lose access to this important benefit by spreading the word and posting a link to this page on your Facebook or Twitter account. Thank you for your support, and please come back soon! I am a air guard and have been for over 10 years and have been deployed 3 times. Can I get some form of forgiveness? An yes I am still in the air guard. Are your loans Federal or Private? If they’re Federal, check out my Guide to the Public Service Loan Forgiveness Program. 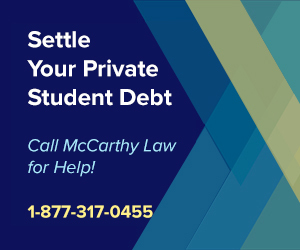 If they’re Private, look at my page on Private Student Loan Debt Relief. I’m a retired army reservist and when I enlisted I had the student loan forgiveness program in my contract. Is that still applicable now? If it was in your contract then you may still be able to take advantage of it, but it’s hard to say. Typically, you’re supposed to use these things while you’re still active duty, or at least transfer the benefits to a dependent before separating from the service. You’ll need to contact someone at the VA to figure out if you can still take advantage of the benefits. Must be nice. I am a US Navy vet 1976 to 1980 under the old GI bill. Went to Collage used part of this bill before it was canceled. To finish college at DeVry I had to take out student loans. I graduated in 1996, loan was around $40000, worked in the defense industry was layed off a few times this a dislocated defense worker on unemployment. Thus no money to pay loans, all Sallie Mae said they could do is place them in forbearance. All the did was add $30000 on top of the loan. So as a 60 year old paying loans since 1996. They have not gone down very much. You cannot tell me I have not already paid the original amt off from over 22 years of monthly payments. It is one big scam. Sallie mae and navient did and do not help borrowers. Unfortunately, your story is basically how lending works, and probably why it was outlawed for most of human history. It screws people over in the long-run, even if it seems like a great idea in the short-term, entirely due to the power of compound interest. Whether or not you’ve paid off the original loan amount, the total amount owed ends up growing over time, especially if the loans were put into deferment where they continued accumulating interest rapidly. Sorry to hear about what you’re facing because it’s definitely not a great situation, and hopefully you can find a good solution for getting out of debt! My name is Mike Odle . My daughter just recently joined the army reserves. She got the $ 30,000 loan repayment benefit as an enlistment ( gift) ha ha. She just finished basic last week she was told that since she got a 4 year scolorship out of school she could not use this benefit because she has no debts. Is this true did her recruiter just screw her making her think she was getting this big benefit just to get her to join. Yes, it does sound like the recruiter basically dangled this benefit in front of her to convince her to join. The benefit only applies retroactively to existing debt, it can’t be applied to anything new in the future. Here’s what I’d do if I were you, have her contact the Student Loan Ombudsman Group. 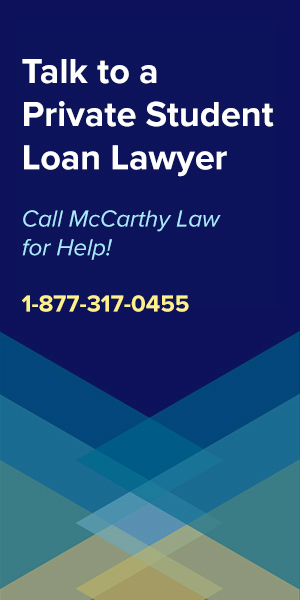 This is a Government-backed group of attorneys who provide free advice on complicated student loan-related issues, and I think they may be able to take up her cause and investigate, and perhaps find a way to help her. Google their name for their contact information. Hi, i signed up for the SLRP program last june and its in my contract but no one knows who im supposed to talk to at my command about the program. Im coming up on my year mark in about two weeks and I just wanted to know that I was set up with the payments of the 33.3% each year. Is there a number i can call to talk to someone or someone I can talk to at my command? 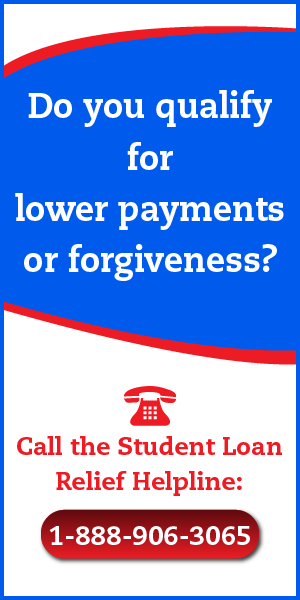 Call the Student Loan Ombudsman Group and ask them if they can direct you to the proper person. Unfortunately, the military doesn’t seem to do understand it’s own benefits programs, and typically has no idea who to send people to. You can reach the Ombudsman group here. I find and read articles like this in hopes of good news for my fucked up (yeah that language is allowed) situation. I joined the Illinois National Guard 10 days after I turned 17 spent the last two summers of my high school life at Ft. Jackson S.C while friends fished and had fun. Came home and was quickly promoted to specialist. While 63 bravo was my MOS I was put in charge of new recruits. This is all in the fall of 2002. In Feb. 2003 I was diagnosed with Type 1 diabetes :/. It was not hereditary and the doctors never were able to get me a straight answer. There were concerns that shots I received in training could of had an effect. Long story short, I was honorably discharged and lost my G.I Bill and tuition. That of course landed me $30k in student loans. I have had two different people from the VA swear that I had a case and they took it and ran with it only to two months later stop returning my phone calls. I keep looking for a program that will forgive my loans but they never show up. I guess 4 more years of working for a non profit. Anyone have any ideas? Thank you for your service and sorry to hear about your situation. I would immediately contact the Student Loan Ombudsman Group and ask them to look into this situation for you. 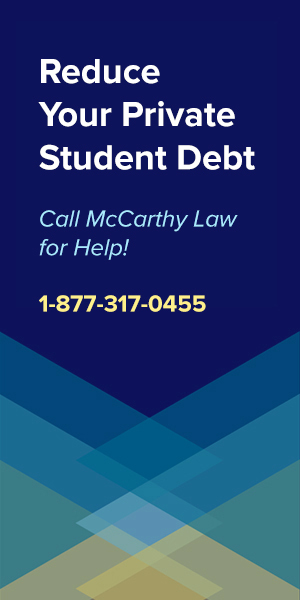 This is a FREE service provided by the Federal Government (they are not a private, for-profit company, and I’m not an affiliate or theirs or anything like that), who help people struggling with complicated legal issues concerning student loans. They should be able to advocate on your behalf, and if you do have a case, they will be able to pursue it for you, at no cost. You can contact them by visiting their website here, or by calling: 1-877-557-2575. Amazing website; it’s truly helpful. Which route would you think would be more benificial? I am a rising junior in college, 4 semesters left until I graduate. I want to get my degree before I enlist. Would it be smart for me to wait until I graduate to enlist so I can receive the 33.3% of the CLRP on all of my loans, or should I enlist in the reserves now, use the 15% in the loans I already have and pay the loans I accrue with the GI Bill ( assuming I sign for 6 years)? The only reason I recomend the reserves is because I want the experience sp I can easily become an officer. Which path do you feel would get the majority of my loans payed off? Which do you feel would be worth it? I am not the best person to ask for military career advice. You’re making a huge decision here and I wouldn’t want to steer you wrong, but my understanding is that you don’t need to start in the reserves to become an officer, and that you may be able to enlist as an officer directly after you’ve earned your college degree. I would speak with some military recruiters to ask them for details about officer enlistment programs for college graduates, then verify whatever information they provide you with by talking to some people actually in the military now. The funny thing about the military is that we civilians hardly understand the way it works at all, but the actual service members seem to know basically everything about how it operates. Don’t trust everything the Recruiters tell you, but start with them, then verify their information by finding someone who’s gone one of the routes you chose. Talk to actual Reservists, speak with some actual Officers, and get them to weigh in on your potential options. Good luck, and thank you in advance for your service! I’m in the process of going to USMC OCS, both the Army and the Marines told me there are no such repayment programs available for officers – are you aware of any changes? Do recruiters get paid more to give you less? The Army had all these promises on their website (I have a masters in finance so I have about 90k in debt) but it appears no one is offering anything! I’m taking a $110,000 a year pay cut to serve my country, the least they could do is offer just a bit more assistance to pay off this debt! How do they expect to recruit talent if we can’t afford to have a family as officers who incurred debt to be prepared to serve. Recruiters don’t get paid more to screw you, so don’t worry about that. It’s possible that my information is outdated, but whatever is on the Army’s actual website SHOULD be accurate! If I were you, I probably wouldn’t take that pay cut. Hello! My husband originally enlisted in the Air Force in 2008 for 6 years. He was his recruiters first recruit so there’s no telling what all he may have missed out on. He was advised that he had to choose between the GI Bill or having his previous loans paid off. Now I’m seeing here that since he enlisted for 6 years that isn’t the case. Since he is still Active Duty, is there any way he can still take advantage of that? Thanks! Unfortunately there’s no way to get any retroactive credit for anything that wasn’t written into the original enlistment contract. If your husband’s enlistment contract doesn’t specify, in writing, that he is to get credit for the Military College Loan Repayment Program, and the Air Force College Loan Repayment Program specifically, then there’s nothing you’ll be able to do. Hello, college senior here. It looks like I’m gonna graduate with about 30K in student debt. I intend to enlist in the Coast Guard after I finish, and eventually apply for the Officer Candidate School a few years in when I have more experience. My question is, could I still get access to the 9/11 GI Bill as well as qualify for the CLRP in that case? According to how I read the Coast Guard website getting into OCS has your enlisted contract replaced with a new contract where you must serve as an officer for an additional three years or so. In that case would I need to serve three years before OCS, or six years and then OCS? Speak with a Coast Guard recruiter for details about your question. Just remember – whatever they promise you NEEDS TO BE IN WRITING on your original enlistment contract. No matter what anyone tells you, or what the website says, you will ONLY GET WHAT’S IN WRITING on your contract! I don’t want to steer you the wrong direction, so please make sure to speak with a Coast Guard recruiter, but remember not to believe anything they SAY. It MUST be in writing on your contract, or you will not receive any benefits. I have a question that I’m hoping someone can help with. I served in the USAF 2001-2006. I went to college on a ROTC scholarship prior to serving, and upon separating in 2006 I was told that I didn’t qualify for Post 9/11 GI Bill due to ROTC. I subsequently went to an expensive business school, Columbia Business School, 2011-13, which I funded by student loans…. I now just learned that I was in fact entitled to the GI Bill and was gravely misinformed when I separated! Is there any way I can get my loans paid with GI Bill or other?? It hurts knowing that I unknowingly left all that money on the table. My advice to you would be to take this matter up with the Student Loan Ombudsman Group. They may be able to help you go after the money that you were supposed to receive. You can contact them by calling 1-877-557-2575. Good luck! And thank you for your service! I have more of a comment. I have been in the military over 3 years and wanted to know if there was a program for those you are serving now to get there loans paid by the military in someway, shape or form. I know some of them you can’t be enrolled in the GI bill, but what if I am enrolled in the GI Bill and I still need help paying back my student loans that I had before joining the military because I was never told any of this stuff when I trying to enlist. Unfortunately, nothing like that exists right now. The LRP and SLRP programs are the only military benefits programs I’m aware of that help pay off existing student loan debt, and to qualify for them, you would have had to have the benefit written on your original enlistment contract. I wish I had better news for you, but as of now, that’s how the programs work. Thank you for your service and good luck. My dilemma: I went to a 4 year college just two months of coming off active duty (Navy). I used my GI Bill up (this is in 1997). I remained in the Reserves and graduated in 2001. After 9/11, I have been mobilized several times since (2x-Iraq, 2x-Afghan, 1x-Bahrain). All hostile/imminent danger areas. I am still in the Navy Reserves. Do I qualify for any Student Loan Forgiveness? If so, what? First, thank you for your service! Second, did you read the whole post? There’s a section on the Navy Reserves College Loan Repayment Program. My understanding is that you’ll need to sign up for a 6 year enlistment, but that should allow you to qualify for up to $10,000 in forgiveness benefits, and you’ll receive 15%, or $1,500 (whichever is greater) in forgiveness after each year of service that you complete. Another idea – look into the Public Service Loan Forgiveness Program. You might be able to qualify for PSLF benefits as a Reservist (maybe not, because it might require full-time work in Public Service and you may need at least 30 hours of qualifying work per week to count). It’s a shame interest rates are so high! Private student loans like Salli Mae or Navient is out of control .The Obama Forgiveness should cover private loans Also!! You graduate and owe $90,000 from a private school and get a teaching job making $32,000 a year !! Then you borrow more to get your Masters Degree and owe another $30,000! This is Organized Crime at the Finest and ultimate act of thievery!! If they won’t accept a low interest rate they should not loan the money!! This country is in the verge of an economic collapse! These young future adults have so much debt they will never have a home or a Life that resembles their parents Life!! They need either to file bankrupt or have a loan Forgiveness that fights Sallie Mae and Navient !! They are worse than the Mob when paying back the money because they have no mercy!! Congress needs to pass a bill immediately !! Help our young people or we have a nation of broke poverty stricken kids who went to school and have a worst life and been lied to!! A shame but true!! This is another place that existing legislation really fails the people of the United States – there definitely should be more tuition assistance and financial aid for military personnel. Unfortunately, the current programs are more about preventing military personnel from accumulating college loan debt, rather than getting rid of existing debt, and all the programs offering forgiveness are focused on current personnel, rather than veterans. I hate to say it, but I thin it’s politics holding things up. In a nut-shell, the Government already got what it wanted from you – your time and service. They don’t see a huge need to offer you much assistance now that you’ve moved on. Their focus is on attracting and retaining new blood for the military machine, which is why all the big time offers are for new recruits, or to retain personnel thinking of leaving. I wish I had better news for you, but the fact of the matter is that we’ve got a lopsided system in place. One that’s screwing an extremely important segment of our population – veterans – who deserve to be revered, rather than reviled. How did this happen??? Did you use the old Montgomery GI Bill or the new Post 9/11 GI Bill? And what occurred? Did you get your degree, then try to get all the costs paid for after you had already paid them? I’m sorry to hear about your situation. It’s a travesty that we’re allowing our military personnel and veterans drown in so much student loan debt. These programs are a joke. I currently use the SLRP and it will never truly pay off your loans. As a reservist they only pay 15% of my loan annually while they force you to use federal loans that have an astronomical interest rate of 6.8% so it hardly makes a dent. And to further add insult to injury they hold out a large chunk for taxes. Why tax this benefit? This seems like it’s placing another unnecessary burden on students who already have with high debt burdens to handle! Also if they mess up any of your paperwork and delay your payment, you are still responsible for all the payments until they fix their issues. My last two payments have been at least 8 months late each and none of the issues ended up being something that I could have controlled. Lastly if you actually do pay off part of your student loans, they reduce their payment drastically thanks to this horrible system. Why not just pay a flat amount each year until either your loans are paid off or the benefit runs out? Having to fill out paperwork every year only helps things gets messed up later by others and makes more unnecessary work instead of just making a simple yearly payment of the same amount. Thanks for stopping by John. I completely agree with much of your analysis here – this system is Government bureaucracy at its absolute worst! It’s overly complicated, inefficient and confusing. The current SLRP system helps keep Government paper-pushers employed though, and it confuses many military personnel enough that give up on trying to use SLRP benefits at all (which saves the Federal Government money). With that said, however, these are significant benefits and many service personnel have been able to reduce their student loan debt by tens of thousands of dollars with SLRP benefits, so it’s not all bad. Sorry it’s not working for you as well as it’s supposed to. If I were in charge, I’d immediately implement a rules change to make it work exactly as you described – $8,125 per year for the service commitment, or until the loan is entirely paid off.